Geom is a Puzzle title developed by Pablo Millan a one-man indie developer who just recently became an official Wii U developer! His first game Geom is a puzzler title that focuses on scoring big in each of the three modes of play which all have different rules and ways to score! 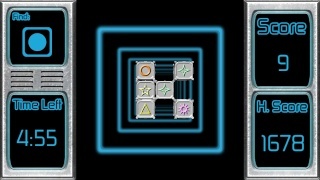 The gameplay itself is easy to learn, but difficult to master as scoring big will test your brain in a big way. 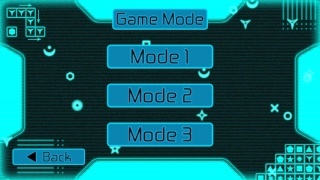 Of the three modes the first is by far the easiest because you can move tiles anywhere you want before matching them, while mode two requires you to clear specific shapes that are shown in the top-left corner of the screen, and mode three has a similar concept as two, but the blocks scroll vertically making it difficult to match the shapes. The touch screen controls are a perfect fit for a game such as this one and they're quite smooth and easy to learn, while the Off-TV Play is a nice touch! The graphics are simplistic as they should be in a title like this, but the blocks and background also have so much depth that it almost feels like a 3DS game with the stereoscopic 3D turned on! The music and sound effects are also fairly simplistic, which is good for titles that force you to use your concentration to score big! 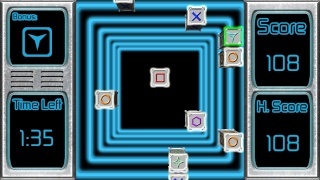 If you're a fan of the puzzle genre the superb gameplay and several challenging game modes you will likely enjoy this title, while the solid touch screen controls and simplistic graphics and music will allow you to concentrate on the game without being distracted, all in all Geom is a great game that is well worth its almost non-existent price! You're the first to review this game. Nice review! "well worth its almost non-existent price!" What's the price of the game then? Who decided to drop the info boxes in reviews? If I can find a new graphics designer we'll be able to use the new reviews style again, but right now it's impossible for me to do so with just the Wii U browser. $0.99 is cheap for a game that has been given a score of 8/10 lol. The score is way too high in my opinion. I would give this a 6/10. @FM_Alchemist wrote: The score is way too high in my opinion. I would give this a 6/10. The reason for this is because the game is under a buck. It might not have much replay value and certainly isn't loaded with features, but the content it does have is very fun during short bursts of play so I feel that the game is superb and well worth its price-point hence my high level of recommendation for this game.